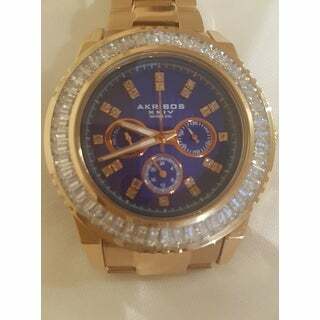 This great look from Akribos XXIV displays a row of genuine crystals on the bezel and genuine diamonds on the dial. With subdials that display the date, day, and GMT this watch is sure to impress. This watch was truly stunning! It was very heavy, which means quality to me. The crystals were shining and large, yet this is a very classy watch, and not overdone. The rose gold tone was nicely polished and the blue face was lovely. It was hard to see the diamonds though, as they were small, but the crystals make up for that, as they are brilliant and large. The quality of the packaging was excellent. They had the watch band covered in a protective plastic, with their tag, and the box was big and very nice for gift giving. You could see that it is stainless steel on the back, too. Because of the diamonds and crystals and beauty of this watch, this is the best and most beautiful watch out there, in my opinion, and an excellent value. This watch made my husband feel very special. This price is great as it is valued on their website as being much much more! The only thing men need to know is that if they want a light watch, this is not it, for it is heavy with good workmanship. We are beyond happy with this watch!! Thank you! I purchased this watch for my son as a Christmas gift and the picture on Overstock doesn’t show the true beautiful rich looking workmanship that one can see in person. The Blue face is stunning, the baguettes are shiny and nice and the gold tone band is super attractive. This is a must buy. Looks great on my guy and he loves it! This is an Elegant time piece. The spark in the stones is good on daylight and the stones had been perfectly aligned. In a sunny day you'll be making a lot of flash and sparks with your normal conversation movements without knowing. The quartz movement on the second’s small needle and the other two needles has been meticulously aligned with the second's marks on the sphere so that you know exactly how many minutes and seconds are left before the hour. That alone speaks tons about the care taken in putting this watch's handles once the machine has been placed inside its case. I couldn't give it the 5 starts though because there's a big design gap. Whoever decided to reserve such a tiny sub-sphere to show the day of the month most be thinking that everyone carries in their pockets a magnifier. Unless you have the sight of an Eagle it is simply IMPOSSIBLE to read the number of the day which is shown on the sub-sphere next to the 3'o clock position. Also, until this very moment I have no idea on how to adjust the day of the week which is shown on the sub-sphere next to the 9'o clock position. The sub-sphere on the 6'o clock position is a 24 hours converter fairly easy to use. In general, is a good buy for your money. Very good looking watch. Nice for dressing up a suit or good with jeans and a T - Shirt. I’m very happy with this purchase. I get lots of compliments. If you like bling this is for you. 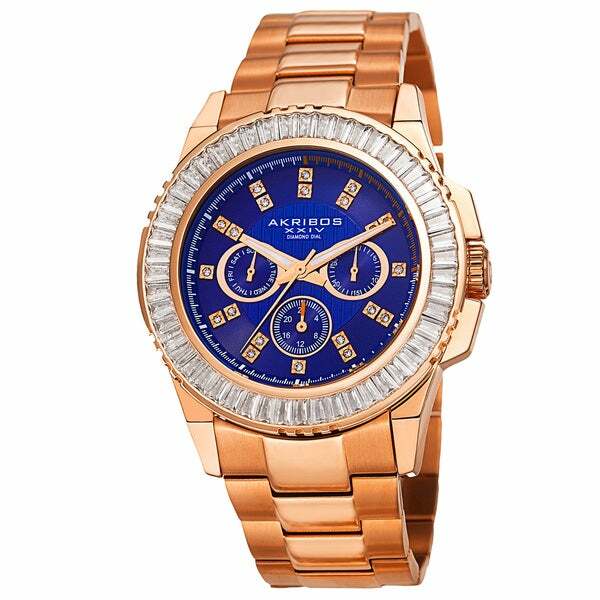 I think rose tone gold and the blue dial is an exceptional look. This is one eye catching time piece. It definitely gives you the bang for your buck with out a doubt. The blue face and rose gold color of the watch go together very well, I've gotten so many compliments and everybody always asks where I got it. I tell them all my jewelry comes from Overstock, they definitely have the right jewelry at the best prices no doubt!! My husband loves It! This watch has "very rich" and stylish look. Definitely an item to impress. If you you have a man in your life who likes to be noticed - this is a perfect gift for him. Just don't tell how very little you spent it. It is a steal! This watch is very classy! It’s the talk of the room! 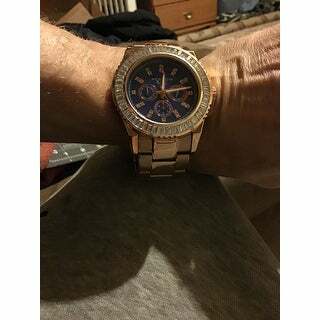 Xmas gift my son got for himself and he fell in love with that watch da moment he opened da box. Beautiful Watch! It looks every bit like the advertisement picture or better in person! I have no complaints about the product itself...However, it was shipped to me with a dead battery. Then I ordered replacement and it also came with a DEAD BATTERY, so I just had to pay $ out of pocket plus travel expenses to get it functioning and operating properly. For the record, I gave 3 stars because of this situation, not the watch itself! The only reason I went thru this mega hassle and inconvenience is because of the FACT I LOVE THIS MODEL!!!! It looks like qualiry and I wanted real diamonds, yet the crystals make it look even richer. I also like the stainless steel back. The price was pwrfect, as well and i was lioking for the royal blue face color, which is hard to find.